In the relentless onslaught of time, one could argue that the only constant to the landscape of our world is change. First launched in April 2015, UOB will be revising the interest rates on the UOB One Account for the first time, in less than 2 weeks with effect from 1 August 2018. This article aims to provide an overview of the upcoming changes and whether the existing account holders stand to benefit from the revision. You may also wish to refer to the t&c for more information. The most striking change to the interest rate for the UOB One Account is the increment in the maximum account balance for which bonus interest is accorded. You may now earn higher interest on your first $75,000 instead of the current $50,000 cap. It appears that the revision would align with the upcoming increase to the deposit insurance coverage to $75,000 per depositor from 1 April 2019. The criteria to earn interest on the UOB One Account have remained unchanged with the minimum spending of $500 on UOB credit cards as the primary requirement. The secondary prerequisite to earn additional interest continues to offer an option between the salary crediting of at least $2,000 or the payment of 3 bills via GIRO on a monthly basis. You would probably have noticed that the revised account balance for the interest rate are broken down into smaller tranches of $15,000 instead of the current $20,000. Even though the revised interest rate will now start from 1.85%, the interest step-up for each tranche (up to the first $60,000) has been drastically reduced to 0.15%. If we were to assess the current and revised effective interest rates for each $10,000 accumulated, it will be apparent that the revision of interest rate creates an unfavourable situation for account holders with $40,000 to $50,000 balance in their accounts. At this balance amount, they would face an interest rate decline of 0.23% to 0.40%. The juicy interest rate of 3.88% will only be applying to the greater balance amount of between $60,000 to $75,000. By plotting the trends of the current and revised interest rates, we can observe that the current interest rate is higher between the account balance of $32,500 and $57,500. For someone with the balance that falls between this range in his bank account (e.g., $50,000), placing his savings in either Maybank SaveUp Account (3%) or BOC SmartSaver (2.35%) would probably be a better choice to maximise the effective interest rate at this balance amount. Of course, this would also depend on his savings/spending/earning pattern to fulfill the relevant criteria. For someone with account balance that falls beyond the aforementioned range (less than approximately $32,500 or more than approximately $57,500), the revision could possibly be a cause for rejoicing. The revised interest rate will start 0.35% higher at 1.85% for $5,000 balance and end with 0.798% higher at 2.436% for $75,000 balance. 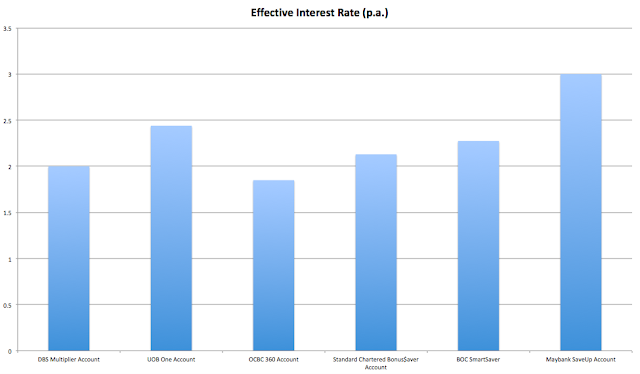 Overall, the effective interest rate over the maximum account balance has raised by a paltry 0.01%. (0.004% to be exact; the difference of 0.01% is derived from the rounding down of the current effective interest rate and the rounding up of revised effective interest rate). This is evidenced from the peaks of the current and revised interest rate trends which appears to be of similar values. Nevertheless, I would still regard this as a positive change due to the cap increment for the higher interest rate. The additional $25,000 will be put to work harder if you have spare cash lying around. Following up from the previous post on the comparison of active savings accounts, let's see where does UOB One Account stand with the upcoming revision. With the 50% increment in the maximum account balance for which the bonus interest are accorded, the UOB One Account has clinched the second place in this segment, with a slight lead ahead of OCBC 360 Account. 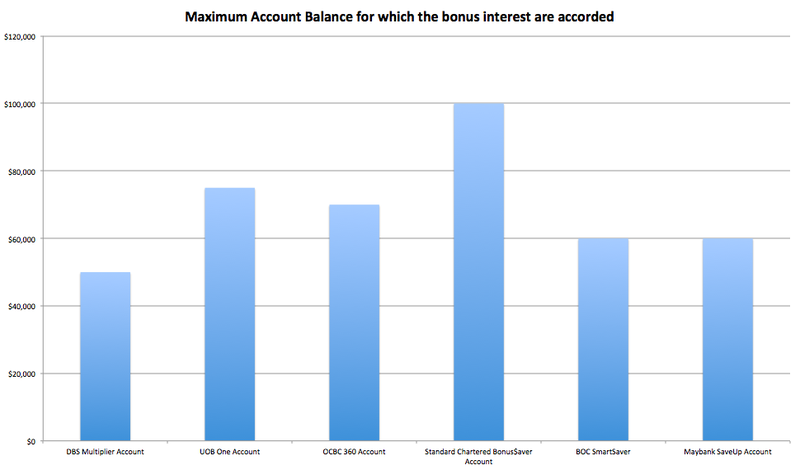 For the greatest maximum account balance, the Standard Chartered Bonus$aver Account still leads the pack at $100,000. 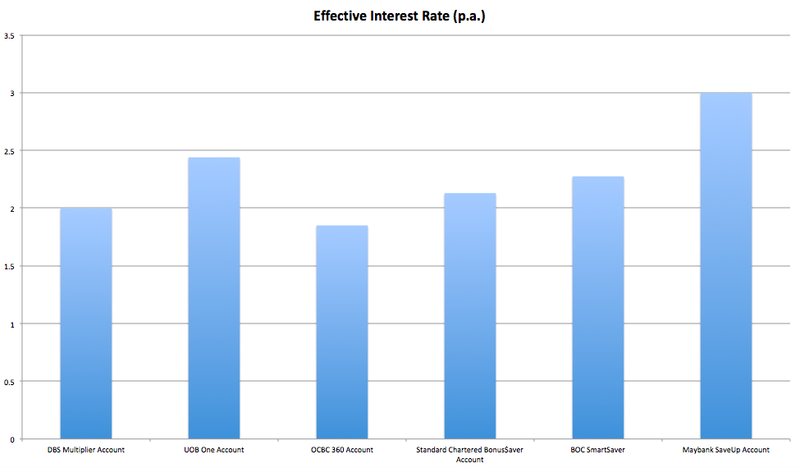 Given the meagre 0.01% raise in the effective interest rate for UOB One Account, there is insignificant change to the effective interest rate ranking corresponding to each bank's respective maximum account balance as previously discussed. Maybank SaveUp Account still offers the best bang for the buck at 3% effective interest rate, with a rather taxing requirement of at least $300 GIRO payment or the qualification of any of the other 6 products/services. UOB One Account still retains the runner-up at 2.44% with comparatively relaxed criteria. As briefly mentioned in the post on my portfolio review in June, I have recently accumulated my position in Starhill Global REIT ("SGR") at $0.64 in June, bringing down my average price to $0.684. This translates to a distribution yield of 6.46% based on the annualised 3Q FY17/18 DPU of 4.42 cents. At the recent closing price of $0.655, this price level is probably last seen back in 2012 and it could have been driven down by a myriad of internal and external factors. Based on the 3Q FY17/18 Financial Results, SGR has reported a discouraging quarter with a DPU of 1.09 cents, a decline of 7.6% year-on-year("y-o-y") and a reduction of 2.3% y-o-y in the NPI. This is likely to be the dominant factor leading to the weakness in its share price. Based on the chart of the historical DPU performance, the annualised 3Q FY17/18 DPU of 4.42 cents closely resembled that of FY2012 which produces a DPU of 4.39 cents. It could probably be of little surprise that the share price has fallen back to the 2012 price level with investors demanding for a corresponding distribution yield. 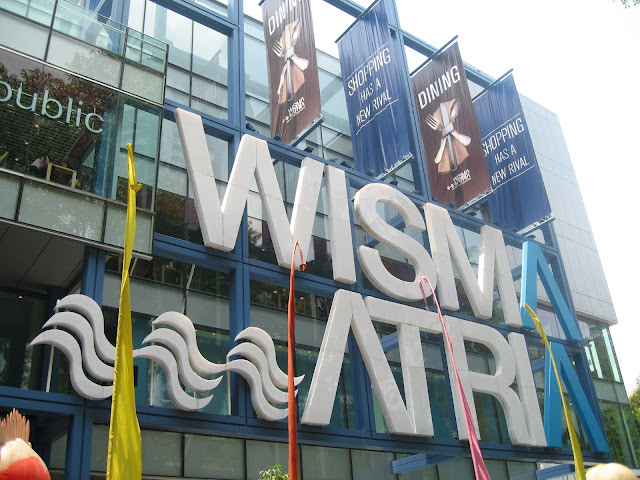 Notably, even though the committed office occupancy rate for both Wisma Atria and Ngee Ann City have improved approximately 1.4% from the previous quarter, it is still considerably lower than that of 3Q FY16/17. If we were to extrapolate the increment trend, it might be able to match up with the office occupancy rate y-o-y in the following quarter. As for the Australia properties, it appears that the renovation works for the anchor tenant, Uniqlo at Plaza Arcade is still ongoing. 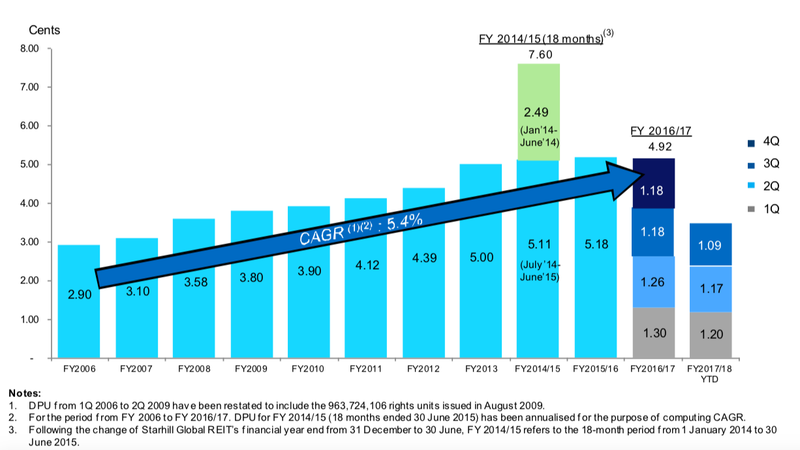 On the other hand, the occupancy rate for Myer Centre Adelaide hovers around the low 80% range with sluggish growth. SGR has recently divested one of its Japan commercial properties, Nakameguro Place on 8 May, bringing down the number of properties in its portfolio to a total of 10. The Nakameguri Place forms part of the seven Japan properties which was acquired back in 2007. The four-storey freehold property is mainly used for retail purposes and has 3 tenants. The property was sold at approximately S$6.4 million which represents a 25% premium to its latest valuation. The sale proceeds will be used to repay Yen loans and for working capital purposes. By asset value, the property is reported to account for only 0.2% of SGR portfolio. Therefore, the sales probably would not have a material impact to SGR financial position. If you are a follower of the mean reversion theory that a stock's price will tend to return to the long-run average price over time, let's have a go at studying the historical mean for the share price of SGR. Based on the historical data from Nov 2007, the average share price is at 0.714 as represented by the blue line in the chart. At the closing price of $0.655, it is currently trading at 8.26% below the mean price. Having IPO in 2005 at an adjusted price of 0.767, the performance of the stock has been nothing spectacular and the price has remained bounded within one standard deviation above the mean in recent years. Personally, I would consider the recent performance of SGR to be relatively disheartening. Nevertheless, I think the decline in the current share price would have compensated for the deteriorating DPU correspondingly. In addition to that, the discount to its NAV also provides some safety net in the worst case scenario that SGR has to liquidate all of its assets. Hence, I have accumulated my position in SGR which now makes up the second largest holding in my portfolio. It will probably be for the long term before we can observe an improvement in the revenue contribution by Plaza Arcade. I look forward to positive update with regard to the redevelopment work in Perth to be included in the 4Q FY17/18 Financial Results at the end of July.